Andalucia boasts the largest amount of hunting opportunities within the developed world and offers a great selection of all forms of hunting. It is clear why so many hunters travel to Andalucia each year to enjoy their sport and win prestigious trophies. Hunting in Andalucia dates back to prehistoric times, when Neolithic man hunted for food and began cultivating land and rearing livestock. Hunting became popular in Andalucia before the Romans with the arrival of the Greeks and Phoenicians who enjoyed the privilege of hunting freely and without restrictions, with pure breed dogs, while hunting was primarily a sport. Restrictions began in 1772 with the hunting of partridge using decoys, after which there were various rules and regulations made by the Spain’s great hunting enthusiast, Carlos IV, in the 18 th century. Andalucia´s geological evolution, dominated by glaciers gave rise to a great variety of species that have developed as completely unique to the region today. Added to this the flora and fauna is of Mediterranean as well as Atlantic origin, creating a great diversity and uniqueness of animal and plant life. Today hunting is a sport enjoyed by many Andalucians, so much so that some species are in danger of extinction, for example the brown bear, the Iberian lynx, and the Pyrenean mountain goat that became extinct in 2000. New regional hunting laws throughout Spain are now restricting hunting activities to protect endangered species from extinction. Spanish ibex (cabra hispánica) are a unique species in the world. They are famous in Andalucia and highly ranked in the local hunting trophies.. Deer is also abundant in Andalucia, especially in the Sierra Morena. Fallow deer (ciervo) are found in Doñana, La Almoraima and the Sierras of Cazorla and Segura. Roebucks (corzo) are found in some parts of the Sierra Morena, Serania de Ronda, as well as in the hills of Jerez and in La Almoraima. The wildboar (javali) is on the increase due to a lack of natural enemies in the area. Fox (zorro) and rabbit (conejo) are also plentiful as well as, to a lesser degree, hare (liebre) which is generally found in the fertile lowlands of Sevilla and Córdoba. The Spanish red-leg partridge is the most popularly hunted bird. Also plentiful are turtledoves, wood pigeons, quails, pheasants, thrushes and starlings, all of which are hunted to eat, in addition to water species, such as various species of ducks and snipes. Hunts take the form of beats that require a lot of initial preparation. Hunters wait for the moment when the dogs are set loose and will aim at any game they see, while taking care that it is of the legally permitted size and age. Stalking and watching are quite different from the classic hunt technique. The hunter is alone, hiding and waiting for the animal to pass nearby in search of water or food. Turtledoves, wood pigeons and thrushes are stalked by hiding in places where they can be seen flying over and decoys are often used to entice the birds to a hunting area. Another method of stalking practiced in Andalucia is using the aid of various species of eagle (cetrería). The hunter either carries the eagle on the fist while stalking and allows the eagle to fly after rabbits or mice, or allows the eagle to watch from a tree before swooping on the prey. Lancing from horseback is an old method used on flat, open land like that of the Coto de Doñana. The rider gallops alongside a boar, and then lances it with an arrow. Much skill and dexterity are needed to accomplish this method of hunting. For those who want to enjoy the thrill of shooting, but don't want to kill, clay pigeon shooting is an enjoyable option, where participants attempt to shoot at and break clay disks flung into the air at high speed from 8 angles within the range of a semi-circle. Passes a psychophysical and theory test proving knowledge of the arms and current regulations. It is advisable to contact airlines and customs offices prior to trying to cross borders with your shotgun for current details of necessary paperwork. Hunts are generally organised on private estates or run by a hunting club. 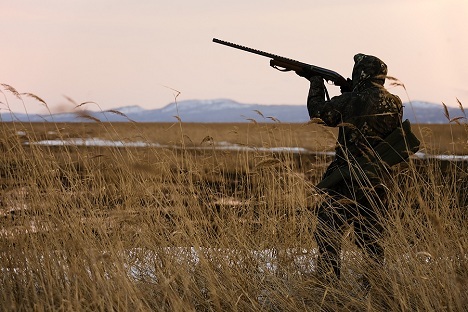 Other organizations arranging hunting are local town council hunting groups, intensive hunting grounds, controlled reserves and national hunting reserves.